Note: Offer based on average sized rooms. Here at Cleaner and Clearer, we’re fed up with over-priced and over-hyped companies selling you the same service for a higher price. We’ve made it our aim to provide you the most professional service and value that money can buy. Why pay more?We only use the very best Prochem chemicals to steam clean your carpets or rugs. Prochem is the largest and most trusted chemical supplier to the carpet cleaning industry. We refuse to use anything else, especially lower quality cheaper products that may damage your carpets.Don’t forget, we’re more than happy to carry out work for both tenants and landlords since we also clean windows. There really is no point hiring a separate company to clean each of these items when you can get us to clean them all at really great prices. UNLIKE OTHERS, WE SUPPLY YOU WITH A RECEIPT AS PROOF OF CLEAN! Longstanton Carpet Cleaning guarantee all work carried out and we also have full cleaning insurance to make sure our operatives are covered to work in your home. If you hire any company to carry out work, ensure they have insurance in place to protect both you and your carpets. Why Should I Use You? Hey, look, you don’t need to use us. However, if you check out our testimonial page, you’ll see many happy clients. We’d really love to add you to this list! I’m a tenant. Will you give me a receipt for my landlord/letting agent? Absolutely! We’ll give you receipt straight away and we’re also willing to email your landlord or letting agent with a PDF copy if needed. How Can We Reach You? Feel free to call us on 0845 527 7101 or email us: info[@]cleanerandclearer.co.uk. We’re open until 9pm. Are Your Guys Insured? Yes! We’re insured through Glemham Insurance – Certificate Number GMQT726111XB. The only thing we’re not insured for is a terrorist attack! Other than that, we’re good to go. Can You Come Out At Short Notice? Right now, this minute. Probably not. However, we’ll try our hardest to get out to you as soon as possible (probably the next day). This is dependent on how busy our schedule is! People don’t think twice about regularly cleaning the clothes to keep them clean, fresh and hygienic. However, carpets and upholstered furniture also needs periodic cleaning for the very same reasons. Over a series of years your carpets will accumulate a build up of soil, grit, hair, human excrement (you get the idea). Another big problem of not regularly vacuuming and cleaning your carpets are dust mites. 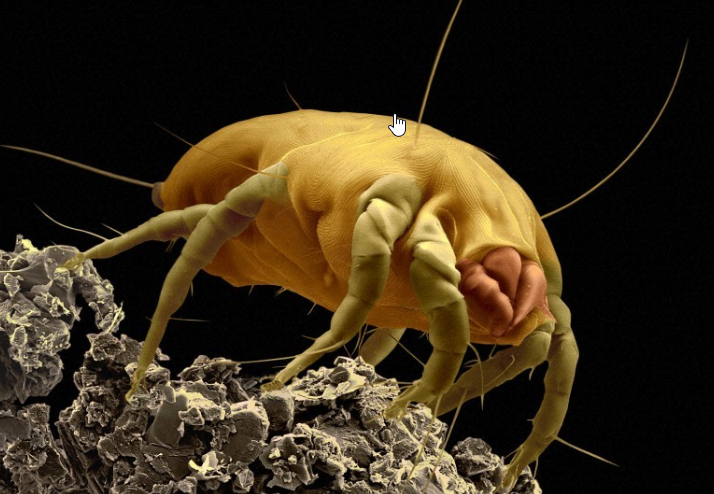 This is an example of a dust mite lurking in your carpet. Getting your carpets cleaned professionally can help eliminate them. Even though you can see some dirt and dust on the surface of your carpet, the vast majority of the dirt is ingrained within the carpet fibres (hidden). Some believe upto 85% is unseen and lurking underneath the carpet pile. Increased life expectancy – This might be a pretty bold statement. However, by regularly vacuuming and having your carpets cleaned periodically will help ensure the life of your carpets. Stain Removal – It’s quite funny what most clients do all around the country that are similar to each other. They generally tend to get their carpets cleaned when they are having an inspection from their landlord or letting agent or if they are having family or friends over to stay. Whatever the reason, having your carpets professionally cleaned can eliminate those stubborn stains, marks and dried in spillage. A more hygienic environment – You may have small children or even pets. Removal of built-up soil and debris will help protect them. Improved appearance – Even if you have really old carpets. Having them professionally cleaned can help improve the overall appearance and bring them back to life. Elimination of mites and bacteria – Eliminating them helps with reducing the risk of allergies, mould and other potential problems. Deodorisation – This is a major reason why professional carpet cleaners get called out. People can either smell their own carpets or worse somebody has told them that their carpets smell. Having them professionally cleaned will (in most case) remove that horrible smell and offer specialist treatments to ensure a fresh, clean smelling carpet. Vacuuming your carpets regularly is really important. Not only will this help remove dust it also helps remove dust mites. However, most vacuum cleaners don’t have a rotating brush. This is critical! Not having a rotating brush at the bottom of your vacuum cleaner really means that you are only removing things from the surface of the carpet fibres. Additionally, you can have your carpets cleaned by a professional who will not only vacuum your carpets properly, they will apply powerful but safe chemicals that help with cleaning process. The machine they use will also apply hot water and steam that kills dust mites, bacteria and any other nasties lurking in your carpet.